Do you want to lose weight, be healthy and age well at the same time? Japanese superfoods might be your answer. With just two E-Books (worth A$59.98 -SAVE $15! ), you will quickly master the art of Japanese superfoods and accomplish a healthy lifestyle naturally that many do not know about. 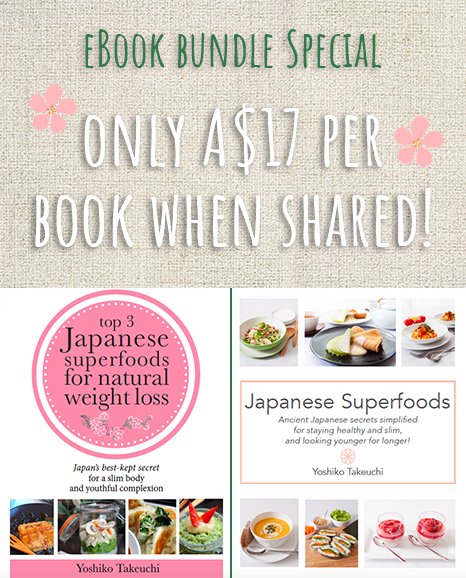 Japanese Superfoods (RRP A$29.99) includes information on 20 Japanese superfoods detailing their basic use, as well as their nutritional and health benefits. Top 3 Japanese Superfoods for Natural Weight Loss (RRP A$29.99) focuses on three Japanese Superfoods that greatly contribute to natural weight loss. You will learn basic to detailed information of these three foods and 5 tips for Permanent & Achievable weight loss without extreme dieting. Not only are they easy to incorporate into your everyday meals, they also taste delicious! Share and save even more!